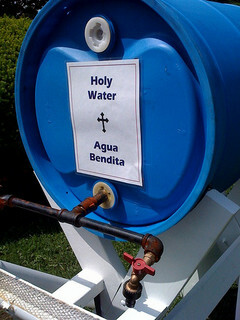 while upon a closer look some links become evident between the Unitary Patent and the IP sceptical and computer affine Piratenpartei that fears so called 'software patents' like the devil avoids holy water. As to the EU Patent, The German industry association Bundesverband der Deutschen Industrie e.V. (BDI) has held a conference titled Tag des geistigen Eigentums – Geistiges Eigentum verpflichtet (Intellectual Property Day - Property entails obligations) on which executive and professional representatives expressed their expectations that a conciliation on this matter can and will be reached until next meeting of the EU Competitiveness Council, while the FFII and representatives of the German Piratenpartei expressed their concerns that the Unitary Patent might turn out to facilitate legal acceptance of so called 'software patents'. Meanwhile, Baroness Wilcox stressed the UK Government's opposition against bifurcation and its strong demand to see the central division of the Unified Patent Court be seated in London. Clearly, no significant moves will be made prior the second round of the French presidential elections on May 06, 2012. Angela Merkel still supports Mr Sarkozy, while the relationship between Ms Merkel and Mr Hollande is continuing to deteriorate rapidly in particular as Mr Hollande appears to insist on re-negotiating the EU fiscal treaty. Should Mr Sarkozy get re-elected, he might see himself being politically deeply in Ms Merkel’s debt, a situation which might enhance Germany’s chances to get the seat of the Central Division provided that all other issues can be sorted out. But what happens if Mr Hollande turns out to become the next President of France? It is known that in general Mr Hollande is more open to positions of critics of the current system of Intellectual Property than Sarkozy ever was. But clearly, arguing in an election campaign is one thing, and ruling a State under the limitations imposed by reason of state is quite another.